Young people aged 12-16 can sign up now for a free Street Dance workshop on Wednesday 24th April at Ramoan Parish Hall in Ballycastle. The workshop is part of the partnership programme between PEACE IV and Causeway Coast and Glens Borough Council’s Arts Programme. It is being delivered as part of the Council’s €4.3m funding award from the European Union’s PEACE IV Programme, managed by the Special EU Programmes Body. Participants will be taught by award-winning international choreographer and dancer Cuthbert ‘Tura’ Arutura, the founder of Artfrique. Tura will teach young people a wide range of dance styles, techniques and provide tips from his experienced past in TV and radio. He recently appeared in the BBC One series ‘Dance Back in Time’ and RTE shows ‘An Ril Deal’ and ‘Stetsons & Stilettos’. The free workshop will take place from 12pm-5pm and lunch will be provided. No previous experience is necessary. The workshops, which are part of an ongoing programme which will continue until September 2019, is open to pupils who attend schools throughout the Causeway Coast and Glens Borough Council area including Limavady, Coleraine, Ballycastle and Ballymoney. Priority will be given to those who have started, but not yet completed, a Peace IV Arts or Sports programme. There are additional places for those who have not already enrolled. To register your interest, parents/guardians are asked to email bernice.mccloskey@causewaycoastandglens.gov.uk or telephone 028 2076 2225 Monday to Wednesday during office hours. Registration forms are also available by downloading the link below. 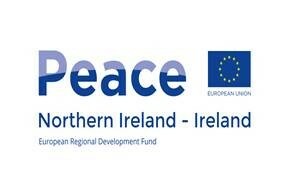 This is a Causeway Coast and Glens Borough Council/PEACE |IV partnership Arts Programme (GR Out of School), supported by the European Union’s PEACE IV Programme, managed by the Special EU Programmes Body (SEUPB). Match-funding for this project has been provided by the Executive Office in Northern Ireland and the Department of Rural and Community Development in Ireland. 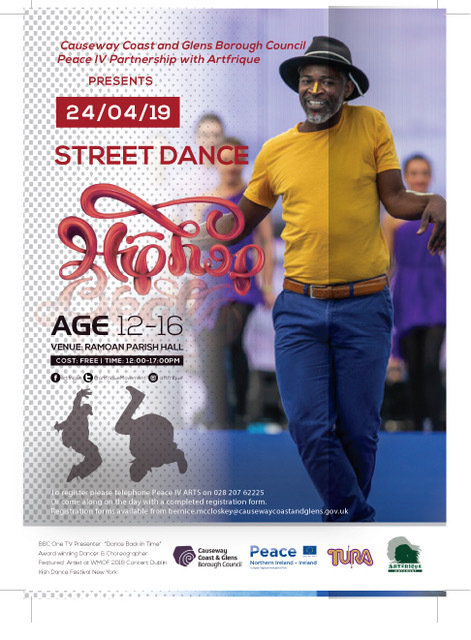 Young people aged 12-16 can enjoy a Street Dance workshop taught by dancer Cuthbert ‘Tura’ Arutura on Wednesday 24th April at Ramoan Parish Hall in Ballycastle.